The year was 1980. Coming out of the 70’s (a decade which saw the emergence of no less directors than Steven Spielberg, George Lucas, Martin Scorsese, Brian DePalma, Francis Ford Coppola, Woody Allen, and countless others) everyone was riding high, and the sky seemed to be the limit. A director (Robert Altman) & producer (Robert Evans) whose careers skyrocketed in the 70’s decided to team up to bring a beloved cartoon character to life in a big screen musical, and they cast the hottest TV star of the day (Robin Williams) in his film debut. Well, depending upon whom you ask, it’s either very little, or everything that went wrong. I’m firmly in the camp that thinks there’s very little not to like about the film. It’s an honest and true adaptation of E.C. Segar’s original Popeye comic strip. Most people were likely expecting it to be closer to the Fleischer Studios cartoon from the 40s & 50s that, while incredibly beloved, bore little resemblance to its origins. 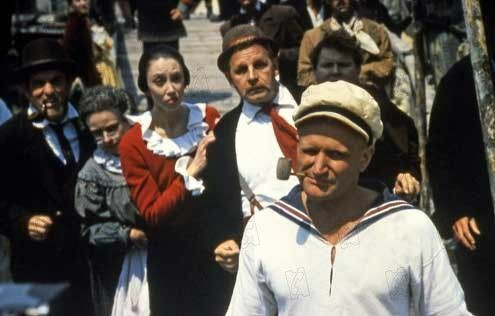 Altman & screenwriter Jules Feiffer decided to return Popeye and the denizens of Sweethaven to their roots, and it makes for a thoroughly sublime film. 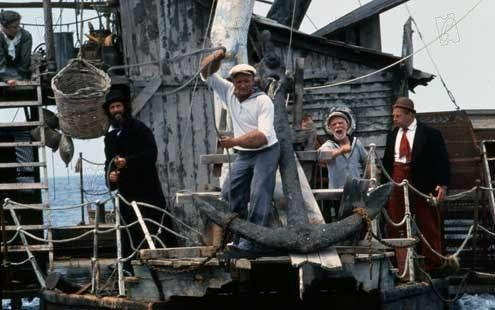 Shot on the island of Malta, the film opens with Popeye (Williams) arriving in Sweethaven, a town isolated from the rest of the world, with its own set of rules that doesn’t cotton to outsiders. 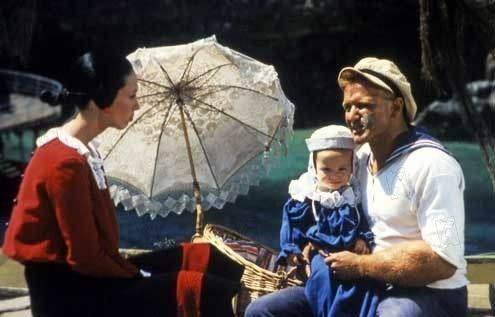 Popeye is able to board with the Oyl family, whose oldest daughter Olive (Altman regular Shelley Duvall) is engaged to be married to Bluto (Paul L. Smith). Bluto works for a mysterious man named The Commodore, and he enforces the taxation laws of the town. 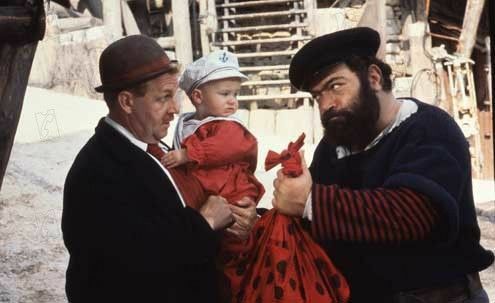 Olive decides to run away, rather than marry Bluto, and she and Popeye form a bond when they come into custody of a small child, Swee’Pea, who was abandoned by his mother. The plot is set into motion when Wimpy (Paul Dooley) takes Swee’Pea to the racetrack, and Bluto forces Wimpy to hand over the child in an attempt to get even with Popeye & Olive Oyl. He brings the child to the Commodore, who turns out to be Popeye’s father Poopdeck Pappy (Ray Walston). It all leads to a high seas showdown involving an octopus, an undersea fight, and Popeye being forced to confront his fear of Spinach. Robert Altman has said of the film, “watch it with a kid sometime. Kids really get that film,” and that couldn’t be more true. 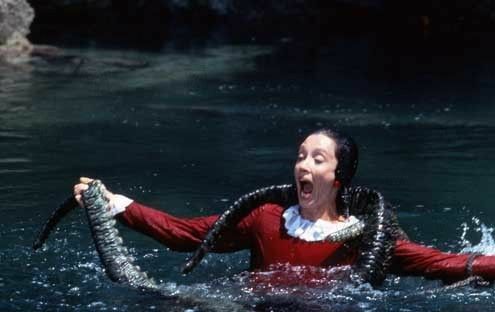 I was probably four or five the first time I saw it, and that may have a lot to do with why I’m so fond of the film. I watched it just the other night with my daughters and they ate it up. It works incredibly well as a family film even though, on the surface, it seems like the kind of film today’s kids would want nothing to do with. It’s a two hour musical based on characters almost a hundred years old, but there’s something truly magical about the whole endeavor. Altman’s signature style of overlapping dialogue & eccentric characters is on full display here as well. One of the things that I’ve always loved about Altman is his ability to make everything seem fresh, no matter how archaic the subject matter is. He took Phillip Marlowe and updated him for a new generation in The Long Goodbye, he took a stuffy genre like British Upstairs/Downstairs class warfare and gave it a refreshing spin in Gosford Park, and he even made Garrison Keillor seem hip in A Prairie Home Companion. This is no less evident here and it gives the film an edge that allows adults to enjoy it as much as kids. The film’s influence is alive and well in today’s films as well. Paul Thomas Anderson, a noted Altman admirer, used the song “He Needs Me” in his 2002 film Punch Drunk Love. The exacting and loving recreation of the original strip can be felt in films as varied as Annie & Sin City. Even Robin Williams’ manic schtick being toned down has its roots here. It’s not the first film people will admit to being hugely influential, but it was one of the first to do a lot of the things that we now take for granted, namely that literary characters will appear on film the way they do in their source material. The film was not a smash hit (though it was also not the financial disaster that some have made it out to be, grossing sixty million dollars worldwide on a budget of thirty). If you didn’t see the film as a child, and you’re just seeing it now for the first time, I encourage you to view it with an open mind. One of the coolest things about kids is that they don’t prejudge everything. They’re willing to watch anything with an open mind, so be open to its charms. If you have children of your own, you should watch this with them immediately, and I promise you will enjoy it, even if it’s vicariously through your children. It’s a strange but lovely film that will work its magic on even the most hard-hearted cynic.